In this way the employees will get a benefit of about 13% Adhoc Relief Allowance 2016, as this ARA-2016 will be applicable on the running basic pay of the new pay scales 2016. These all benefits will be applicable with effect from 1st July 2016. It is to mention here that earlier according to budget speech there are announced 2 adhoc relief allowances to be merged into basic pay. In this way, new revised pay scales chart 2016 is expected soon. 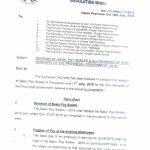 What will be salary of new entrants in BPS 18 in federal government in Ministry of Finance appointed in July 2016. Dear, speech ki copy me "armed forces k jawano ko 1 mah " ye line pori post nahe kindly post it..
Plz inform me abt regularization case of all sindh govt. Adhock employees according to act 2013 passed by sindh assembly. can any dear solve my issue? I recruited in Session Court in PBS-13 as Data Entry Operator (through proper channel) from Pakistan Navy Islamabad where i was LDC in PBS-7. Joining date in Session Court is 10 July 2015. Now my current office saying me that you are not eligible to get annual increament of December because 6 month service is required for this increament, whereas my previous 5 year service is counted. if my previous service is counted and be regular then my annual increament ll be missed. Dear Asif still no updates. Dear Muhammad Zubair it is only for the later sitters. I am KPK employ. Me ney 2 years pehly Mphil kia ta. 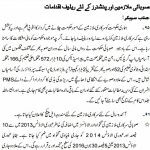 Me Mphil allowance KPk employs ko pehly se milta ta ya ab se start hua h. Mjy arears mil skty hn ya nh. waiting for your reply. Dear Abdul Qadir Shaikh it will soon be confirmed. 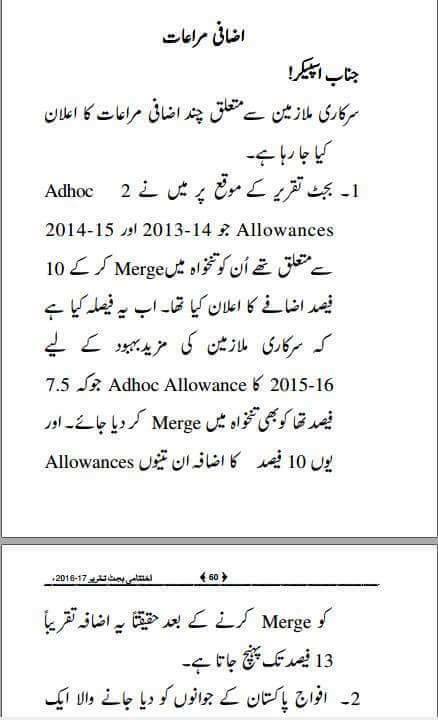 kya Conveyance Allowance 50 % increase nhi horha for BS-1 to BS-15??? as announced in Budget Speech by Federal Finance Minister ?? Madam salam!ek aadmi ki wife sarkari mulazim the death ho gae kea wo admi second marraige kr k bhi family pension ka haqdar ho ga? 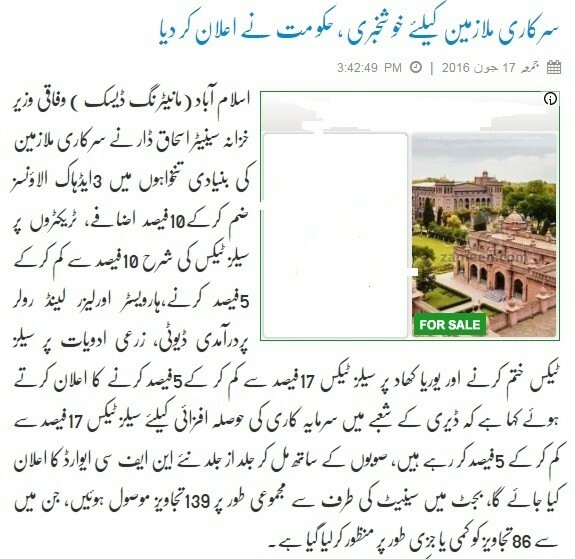 Dear A.D Javed plz contact Mr. Amir Agha for the details of the same. Kpk walon Ka 2015 k ara main se 2.5 continue rahay ga? Dear Atta rehman there are chances so. L/Nike ka house rent 900 se barha kr1215 kr dia hy, nike/havaldar ka 1142 se 1542 and jco ka 1704 se barha kr 2300 kr dia hy. what about pensioners ? They are already suffering and lagging behind due to unjust increase in 2010 of 15% in pension against 50% in pay. KINDLY TELL ABOUT PENSION . 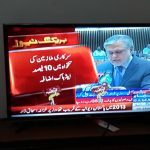 hi, can you plz post the link of post budget Urdu speech of ishaq dar . Ishaq dar ki budget ki ikhtamami taqreer mukammal share kar dain please. What will be salary of fresh appointments in June-2016 Hospital pharmacist BPS-17 in sindh after 03 adhoc merger. Will fresh appointments in june-2016 get these 03 adhoc merger benifits. Kindly send me the proposed chart after this new development. Dear imran, I ll upload the new chart today. In Sha Allah. Dear A.D Javed, according to my knowledge the employee can get LPR if his LPR ends at the age of 60 years. 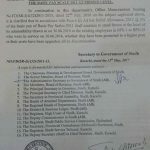 Sindh Government ney 2015 ka adhoc allowance 10% increase kia tha aur federal ney 7.5% to pay scale mey furk aaey ga.
Madam again twist, I think ARA 2015 was 10% in Sindh. Very well... Kuch to Khiyal kiya Hmara b ... Thanks. i think if you link the source of the news that will be great. Dear irfan, i have uploaded the copy of the speech. Glad to know this. I think pay scales 2016 would be prepared 27.5% merging in 2015 pay scale? Thanks madam for sharing these types of information. 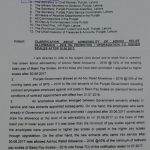 With what percentage, the pay scale-2015 will be revised in order to introduce pay scale-2016 after merging 03 adhoc allowances. respected madam i am relating sindh provnce that i was appointed as pti after getting trainning of jst i gotten change my cadre as jst in the year 1996,now i am HST since 31-05-2012 now sindh government wants to revert in the same cadre pti please guide what should i do kindly reply. Dear Fazul Muhammad Buriro you have to appeal the department and if still not knock the door of the court. Good news...but it has also been heard that there will be 15% increase in ARA 2016 ....is it so? 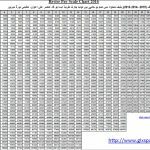 Dear ABDUL GHAFOOR filhal it is 10%. Dear Sir, Very Nice and authentic update from your site, keep it up, and please upload new scale chart as 3 adhoc merged. Dear M. Kashif I ll soon upload the same chart.